FEATURE – A source of water. A source of building materials. A source of recreation. The significance of Dixie Red Hills Golf Course and the surrounding area is lost to many residents and tourists today. 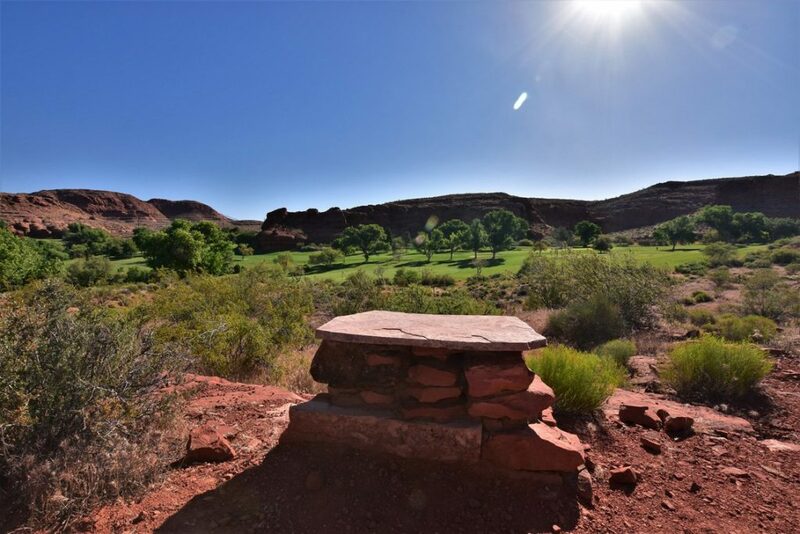 However, delving into its history, it is clear that it was important to early settlers, and a century later it became part of the impetus of economic growth centered around its two best commodities – red rock scenery and favorable weather. A group of settlers was called to the Indian Mission in what became Southern Utah in 1854 and set up their dwellings along the Santa Clara River. 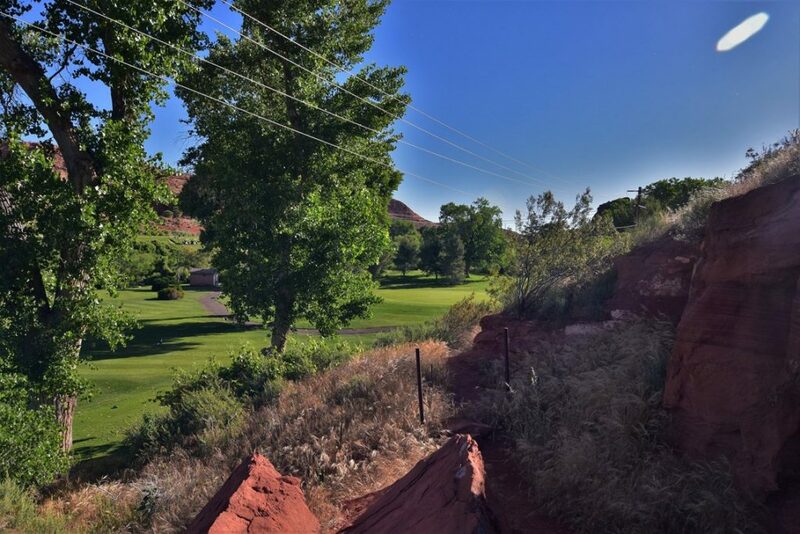 During that period they found a reliable water source (which became known as West Spring or Watercress Spring) that emerges beneath the sandstone cliffs on the eastern end of today’s Dixie Red Hills Golf Course in St. George. 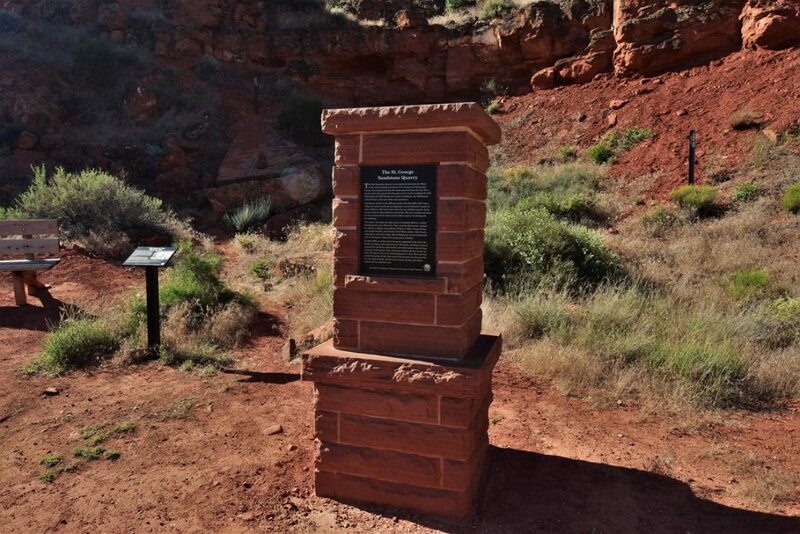 This spring became one of St. George’s main source of drinking water after it was settled in the fall of 1861. Ditches conveyed water from the spring via Diagonal Street, which allowed for a gentle flow of water downhill to town lots, where the water reached on a set schedule. 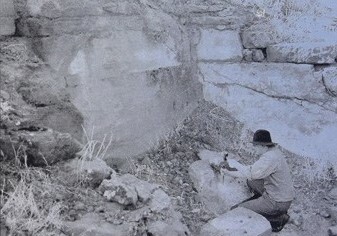 “The clean, clear and reliable water from West Spring was highly preferable to the muddy, sulfurous smelling water of the Virgin River, which was originally named El Rio Sulfureo de los Piramedes by Dominguez and Escalante,” wrote Washington County Historical Society President Richard Kohler in a document titled “Quarry Blurbs” about the quarry area’s history. 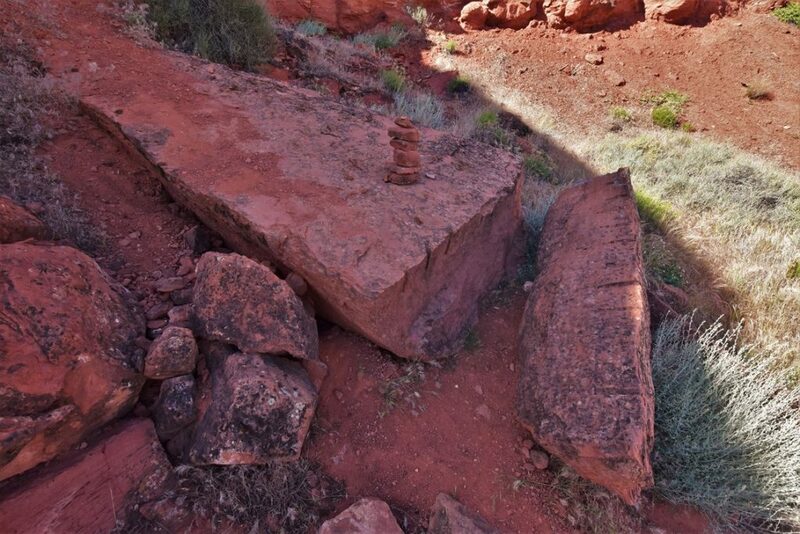 By the spring of 1862, these first settlers began quarrying red sandstone just south of West Spring. Stone from the quarry was used in the construction of most of the important buildings of that era, including the St. George Tabernacle, St. George Temple, the Opera House, the Washington Cotton Factory, the old County Courthouse and the Woodward School, among others. Skilled Scottish quarryman Archibald McNeil supervised the quarry in its early years with Edward Parry as chief mason and a whole slew of stonecutters, fitters, blacksmiths and other helpers. The interpretive plaque at the old quarry site, fittingly encased in a sandstone monument, details that in 1863 there were about 120 hands at the quarry hauling out 50 tons of rock daily. “The quarry was a very interesting place to visit, where the fine, smooth seam-face of rock, the sound of the hammer, the thump of the bar, the rattle of the drills, and the click of scores of picks and chisels made music in a business way,” the plaque reads. At the time of its heyday, the quarry was a 2-mile walk from town, making that one of the most difficult aspects of working in the quarry. Another challenge of working at the quarry was safety with numerous blocks of stone being cut and chipped simultaneously at different heights, meaning falling debris could come from any direction. The quarrymen used the “plug-and-feather” method to extract the stone, which involved drilling small round holes every 6 to 7 inches in a line where they wanted to cut, then inserting a wedge, or “plug,” between two shims, or “feathers,” into each whole, then tapping each wedge along the line until hearing a crack, after which they would tap the wedges the rest of the way in or use a crowbar to pry the stones apart. The massive pieces of stone broken off then needed refining, which was done by cutters who chipped off pieces to make the stones smooth and ready to make the journey via horse-drawn wagon to be placed in the wall of the building in which it would end up. The constant use of the tools such as chisels on sandstone blunted them, which kept the onsite blacksmith constantly busy sharpening the tools. Remnants of quarrying activities can still be seen there today. Apparently, according to Kohler’s blurb, the Shivwits band of Paiutes regularly camped near West Spring during their visits to St. George. Additionally, water from the spring was used for a copper smelter which operated at the end of the 19th century. During that time period, a pond was constructed north of the smelter to hold water required for use in the smelter’s water-jacketed blast furnaces. The pond became a little recreation spot for boating and swimming. The spring also provided water for the St. George Ice Company, which was incorporated in 1907. In the 1930s, the area was home to St. George’s Civilian Conservation Corps camp. Until the 1960s, St. George was mostly a sleepy stop along old Highway 91 for most travelers. The city only had one stoplight, which was installed in 1958. Even though billboards read that St. George was “where the summer sun spends the winter,” the main tourist season was from Memorial Day to Labor Day. 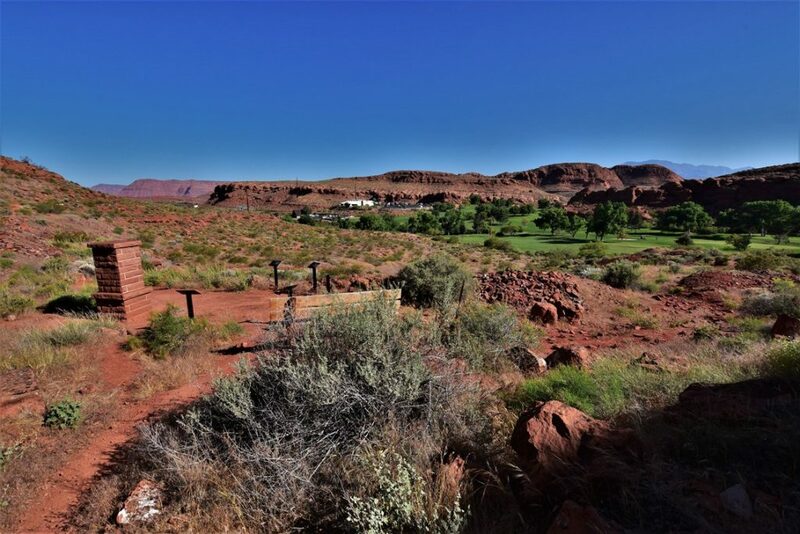 A golf course is the first step toward making St. George a winter resort. People from the North who generally spend their winters in California say that our greatest asset and opportunity lies in this direction. The article went on to say that the climate of the area is “unexcelled” and that there were at the time several places that would make a good golf course. If the town had a golf course “and other like amusements,” the article said tourists would stay longer, St. George would become better known, and some would even establish winter homes in the area. In the 1930s, Heber J. 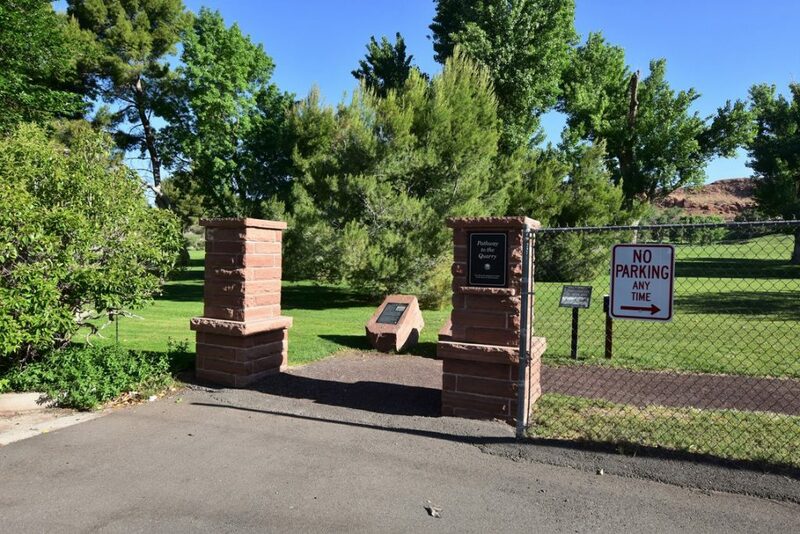 Grant, President of The Church of Jesus Christ of Latter-day Saints, Utah Governor George Dern as well as former St. George mayor Anthony W. Ivins all suggested building a golf course in St. George but nothing came to fruition then. In the 1950s, Washington County Attorney and Utah State Senator Orval Hafen, who was a huge proponent of selling Utah’s Dixie as a recreation mecca and was integral in establishing Snow Canyon State Park, urged for the construction of a golf course as a way to attract more visitors in the winter. “But frugal Dixie farmers had no time to play golf,” Kohler wrote. Still, Hafen was tireless in his promotion of St. George as a destination. Most assumed building a golf course would have to be a private venture and several sites were discussed, including the current site of the Southgate Golf Course, one in Washington City, a property east of St. George and another proposed parcel southwest of town. “The discussions never quite started the capital accumulation though,” Alder and Brooks wrote. It wasn’t until 1960 that the process to construct a golf course actually got moving. At that time professional golfer Jim Colbert contacted Sid Atkin, president of the local chamber of commerce and proprietor of the Sugar Loaf Cafe, asking Atkin what he could do to help St. George construct a golf course. This conversation, apparently, lit a fire in Atkin, who had participated in previous conversations about a possible course. Sid Atkin then teamed up with his uncle, former mayor Joe Atkin, and local businessman Neal Lundberg, who approached golf professional Ernie Scheiter to help them put a plan into action. Schneiter asked the team if the city owned any property, and after working with the city office, they identified the area near West Spring as an ideal spot for at least nine holes. Atkin convinced the City Council to provide the public land for a nine-hole course and to finance construction through revenue bonds to save taxpayers money on something few of them would probably even utilize. A feasibility study determined how many rounds a day they’d have to sell and at what price to charge to cover their expenses. One major issue, not surprisingly, was water. A canal company owned the water rights to the nearby spring, so it was not available. Luckily, future home developer Jay Ence was drilling for water on land just to the west, and if he succeeded, he said he would be willing to provide the water. Thankfully for the golf course visionaries, Ence was successful and negotiated a deal with the city to supply the course’s water. Proving successful in their efforts to convince the major players of the benefits of a golf course, the golf course boosters received the approval of the City Council for a $60,000 revenue bond and the use of city property through a 3-1 vote on Aug. 3, 1964. The council appointed Lundberg to take the lead on construction of the course. Lundberg enlisted the Elks Club and the Lions Club to donate labor to build both the holes and the clubhouse, on which city employees assisted. Ernie Schneiter’s son, Gene, was even appointed the golf pro. Seven holes of the course opened on July 4, 1965. The two other holes were completed a few months later. The success of the Dixie Red Hills Golf Course spawned the development of other golf courses, most notably the Bloomington Country Club just a few years later when Salt Lake-area developers Ellis Ivory and Frank Johnson planned to build a luxury resort community with the golf course as its centerpiece. 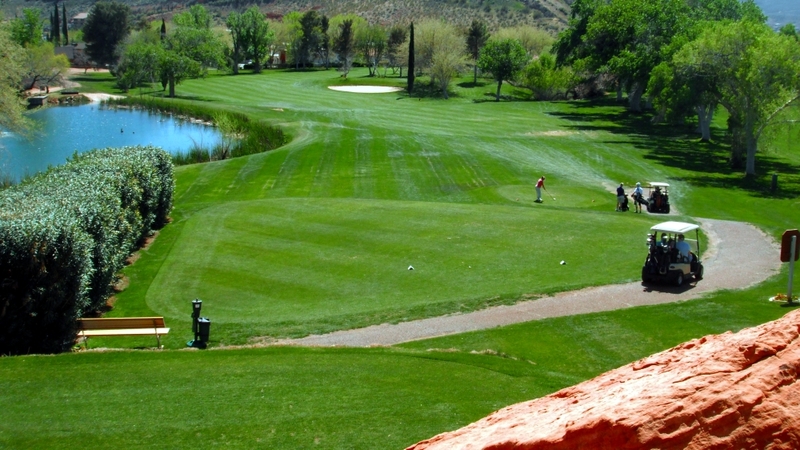 The city of St. George itself established several other courses over the years, including Southgate, St. George Golf Club and Sunbrook. St. George’s first condominium project, Sunstone, sprang up in 1974 immediately south of Dixie Red Hills, a 64-unit project with a clubhouse and swimming pool in California contemporary style. 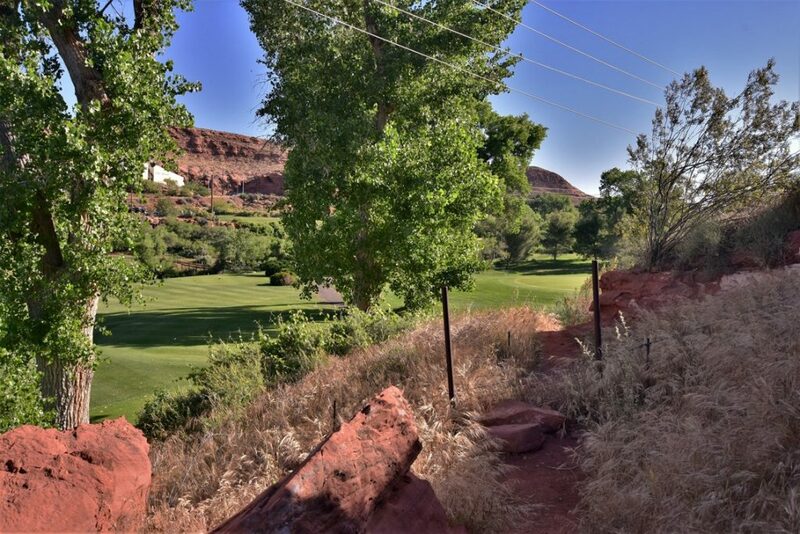 The course has a little claim to fame as one of the only native Utahns to play regularly on the PGA tour, Jay Don Blake, grew up playing on Dixie Red Hills. 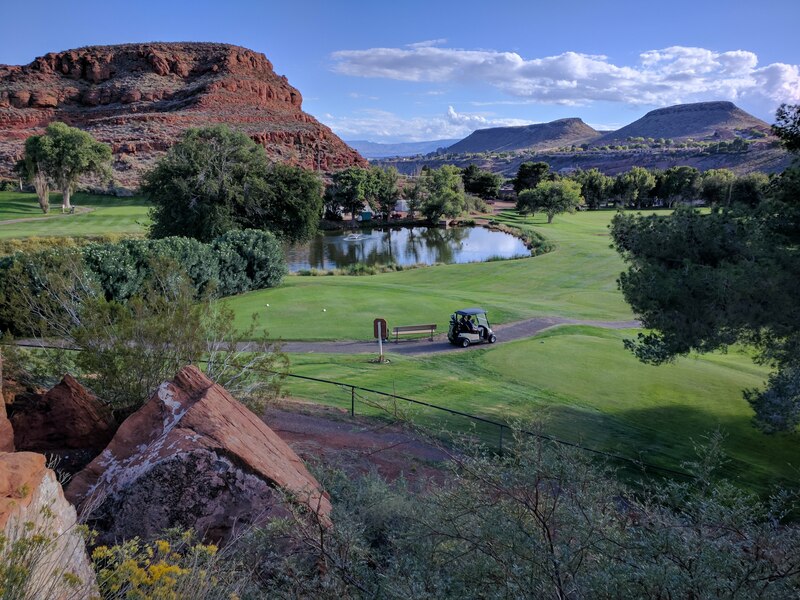 Despite its age, the golf course is still a favorite among many, hosts the annual Dixie Red Hills Amateur in March and was even rated the 24th best nine-hole golf course in the nation by Golf World Magazine in 2010. Other good news for the course is a new clubhouse to replace its dilapidated original clubhouse is currently under construction and slated to be completed this spring. The new clubhouse will be a definite upgrade. It will include restaurant facilities, a lounge area and an overhanging deck for spectators. Almost three years ago, the old Sandstone Quarry came back into public consciousness with the opening of a trail and the interpretive plaques detailing its nearly forgotten history thanks to the efforts mainly of Dr. Wayne Pace, a retired BYU professor and founding president of the Dixie Encampment Chapter of the Sons of Utah Pioneers, an organization which mobilized the resources to make the pathway to the old quarry a reality. 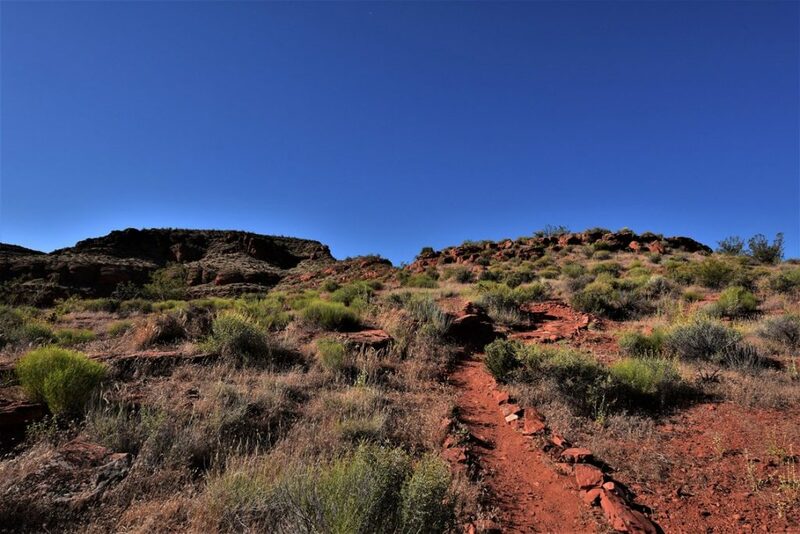 Integral to the construction of the trail in addition to the SUP Chapter was the Red Cliffs Desert Reserve, which manages the tortoise habitat portions through which the trail meanders, Dixie Red Hills Golf Course, which abuts the trail area, as well as the city itself. Along the ⅓-mile trail, hikers will be oriented on the quarry’s history through the plaques and can sit on benches along the way to linger and enjoy the panoramic views. The trailhead is located at the north end of 700 West, which connects to the north end of Diagonal Street. Where 700 West dead ends, there are a pair of sandstone pillars marking the trail.